Northwestern Oklahoma State University teer wrestler Cody Devers, shown competing earlier this year, won the Oklahoma State University rodeo’s bulldogging title this past weekend in Stillwater, Okla.
ALVA, Okla. – Everything fell into place at just the right time for Cody Devers, a Northwestern Oklahoma State University junior from Perryton, Texas. The trip to the Payne County seat was the perfect stop for the Texas Panhandle cowboy, who won the OSU bulldogging title a year ago while competing at Garden City (Kan.) Community College. This year, though, he earned his championship as a Ranger. It seems to be working. 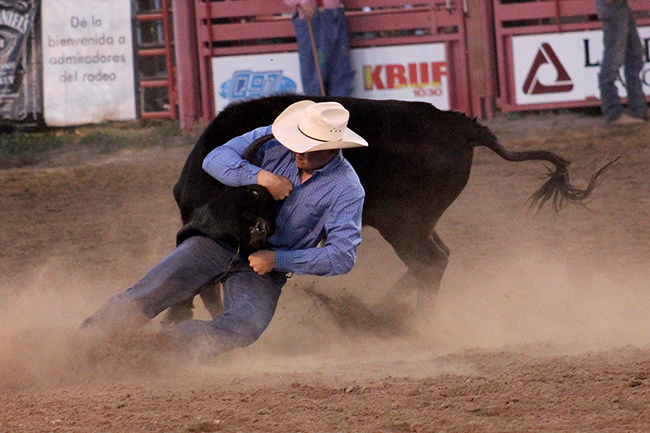 One Ranger has earned the steer wrestling title at all three region rodeos so far this season – Devers in Stillwater; reigning college champion J.D. Struxness in Durant, Okla.; and Joby Allen in Colby, Kan.
Northwestern had several other cowboys find success, including header Dylan Schulenberg of Coal Valley, Ill., who won the team roping title with heeler Wyatt Miller of Fort Scott (Kan.) Community College. While they didn’t place, the tandem earned a spot in the final round, then put on a clinic with a 6.6-second run to win the short-go and the average titles. Another Rangers duo, header Kass Bittle of Kremlin, Okla., and Edgar Fierro of Hennessey, Okla., were third in the long round with a 7.6-second run and placed sixth overall. Tie-down roper Wylee Nelson of Faith, S.D., was finished in a tie for sixth place in the opening round with a 10.6-second run. For the women, goat tiers Katie Miller of Faith and Jennifer Massing of Ponoka, Alberta, worked their way into the short round. Miller finished third in the opening round, then suffered a no-time in the finale, while Massing finished tied for third in the long round, sixth in the short round and sixth overall. Breakaway roper Brandi Hollenbeck, a junior transfer from Hutchinson, Kan., made the championship by finishing in a three-way tie for fifth place in the opening round with 3.2-second run. Team success comes through individual accomplishment, but each individual has a team of supporters and other attributes that help make everything come together. “I’ve got a really good horse,” he said of Sassy, a 7-year-old mare that just made the transition from barrel racing to steer wrestling a few months ago. “She’s young, and I just got her started in July, but she put me in position. I had some good cattle drawn and just utilized them. Now he and the rest of the rodeo team hope to take the next step this coming week as they host the Northwestern Oklahoma State University rodeo, which takes place Thursday-Saturday. “It’s a pretty packed week,” Devers said. “Between class, putting up panels and doing all the other things that go into it, we have a lot going on, and we still have to find time to practice.